Guerrilla Games is one of PlayStation’s first party studios that I feel like has never gotten the praise they deserve. They are best known for the Killzone franchise that started on the PlayStation 2 and saw additional installments on PS3, PS4, PSP, and PS Vita and all of them were great games. Still I think many people missed out on those and after many years working on that franchise Guerrilla has come up with something new to capture people’s attention. 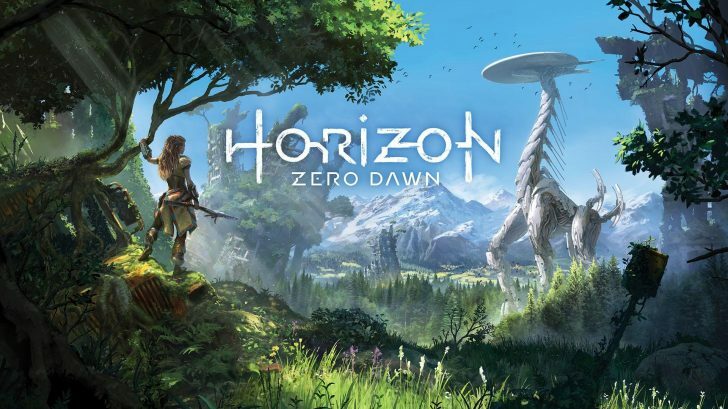 Revealed a few years ago at E3, Horizon: Zero Dawn is a huge departure for the studio as they move from making first person shooters to an epic open world action RPG. Now I must admit that while the premise of the game had my attention I was worried about how well the studio could handle making a game like this on their first attempt and would the story be interesting enough to keep my attention. 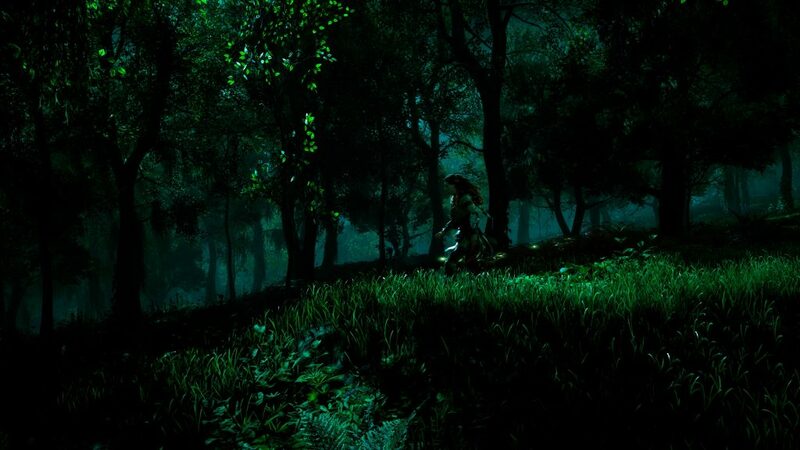 I’m very pleased to say that Guerrilla has not only delivered a great open world RPG but one of the best in recent memory. The game takes place in the far future in what is described as a post, post apocalypse where civilization has fallen and nature has retaken the land. Humans are still around but in a more primitive state and all of them are living in various tribes. 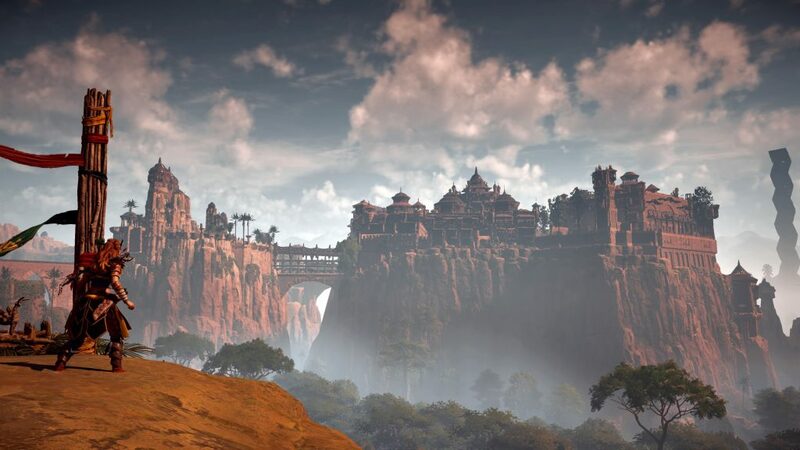 Each tribe like the Nora, the Carja, Banuk, etc all have their own rules, beliefs, style and so on making all of them interesting to learn about. It isn’t just nature that has retaken the land but machines of various shapes and sizes too. Machines that resemble different animals of our time or dinosaurs of the ancient past. Some of them highly dangerous and some that are more docile. No one knows where the machines came from but through the story of the game you will learn much more about them. The game begins with you playing as a little girl named Aloy. She was made an Outcast at birth by the Nora tribe and doesn’t understand why everyone seems to want to avoid her. Another Outcast by the name of Rost takes care of her and raises Aloy serving as a mentor and father figure. 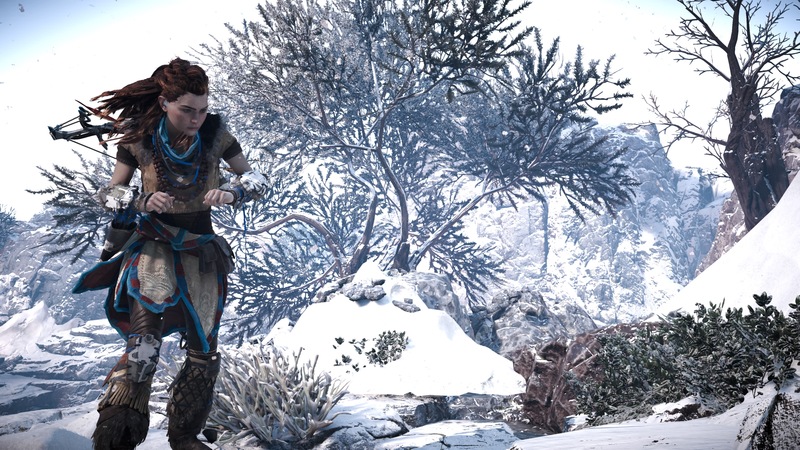 However Aloy always has questions and wants to know why she has no mother and is shunned by her tribe. 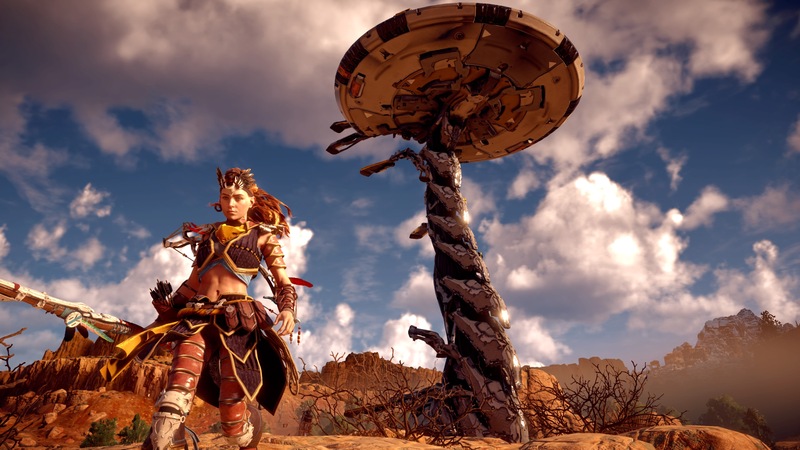 In order to learn more Rost trains her to enter a contest called the Proving that will allow her to get back into the Nora Tribe if she wins which will allow her to find some of the answers she is seeking. Not long after starting the game I quickly grew to like Aloy’s character and sympathize with her. While I was worried about the story coming in by the end I was left highly impressed. It’s an interesting, well thought out narrative with lots of surprises and unexpected events and by the end pretty much all of my questions were answered. It isn’t just the main questline that is interesting but all of the additional side content as well. There are side quests that are a bit longer and more thought out and then there are errands that are usually shorter and not as intricate. One of them might involve you tracking a guy’s sister who has left the sacred land in order to kill a man only things haven’t gone quite as she planned. 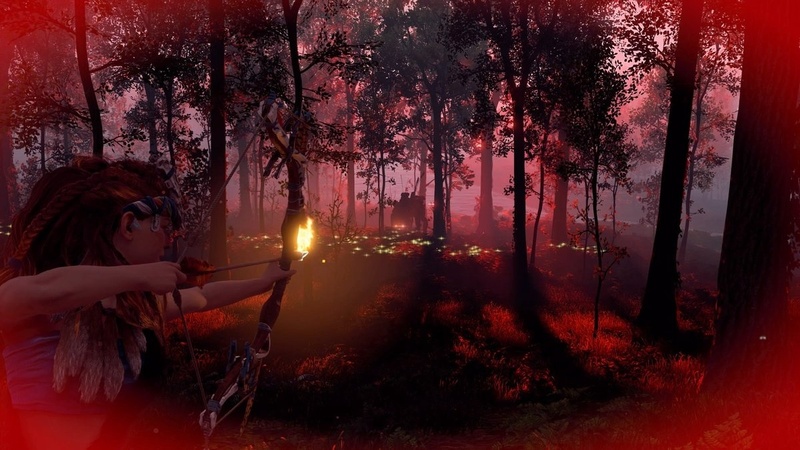 Another will have you hunting a legendary beast that has killed many hunters over the years. They are all worth doing for the additional narrative bits that help flush out this world more as well as the XP and other rewards. I really never touched much of the main story early on in the game as I was constantly finding new side activities to partake in. Other things you can do include participating in hunting grounds scattered across the land that task you with usually killing certain machines in certain ways within a time limit. There are also Bandit camps full of human enemies that you need to clear out so that people may move back in. Cauldrons are like dungeons from other games where you will have a bit more puzzle solving and platforming to do to reach the core and they reward you with the ability to take control of more machines. Tallnecks are huge Brontosaurus like machines that roam the land and allow you to reveal more of the map if you can climb to the top of them. The game really just has so much content to do and it isn’t just fluff material like some other open world games. All of it is meaningful and really helps to bring more life to this great world. Another part of the game that makes these quests so worth doing is talking to people. Pretty much all of the voice performances are top notch with a couple rare exceptions. You’ll navigate these conversations with a dialog wheel like you have probably seen in others games like Mass Effect or Fallout. 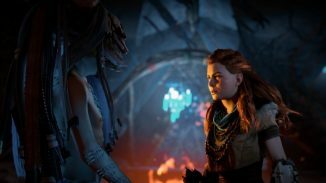 At certain times you can opt to have Aloy give certain responses like a more aggressive or a more compassionate one. There is only one ending to the game so regardless of what you say you will end up in the same place but some characters can die based on dialog choices so they do carry meaning sometimes. Certain characters will even show up for you later in the game if you were kind to them and helped them with their needs. I really loved seeing certain people again at a certain point in the story. Facial animation in the game isn’t quite at the level of something you might see from Naughty Dog but It’s still pretty impressive. Occasionally you run into a weird glitch in the animation but nothing that really takes away from the game. The lip-syncing also doesn’t quite match up but again it didn’t hurt my experience with the game really. Gameplay is another area where Horizon: Zero Dawn excels at. I played the game on the Normal difficulty setting and still found the game to be quite challenging. There are 25+ different kind of robots that you’ll fight in the game each of which has their own strengths and weaknesses. Using the focus attached to Aloy’s ear and pressing the R3 button allows you to enter a detective mode of sorts that allows you to scan these robots and learn about them. Watchers are probably the easiest robot to kill but even they can be dangerous especially in packs. However one well placed arrow to their eye will shut them down in one hit. You can purchase new weapons from vendors that allow you to change up how you approach combat situations. The Ropecaster is used to tie robots down restricting their movement and making them easier to shoot. The various slings allow you to hurl bombs at your enemies while the Tripcaster allows you to place trip wire traps that you can lure enemies into. 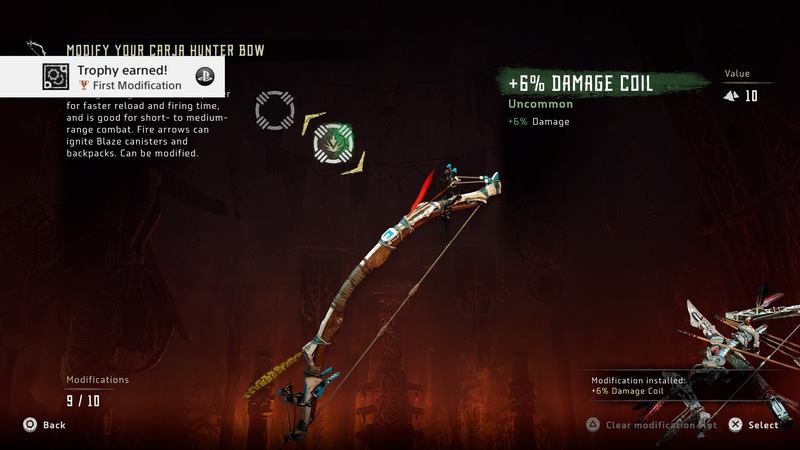 There are various bows with different elemental arrows such as freeze arrows, fire arrows, or corruption arrows that will turn the robots against themselves. Unlocking certain skills in the skill tree will also help you vary your approach up as you can get close to the machines and override them making them fight for you instead. Hiding in tall grass and whistling to attract an enemy is a more stealthy approach you can take and with patience you can wipe out an entire herd doing this. Horizon: Zero Dawn really allows you to approach encounters any way you choose. The perks in that skill tree are unlocked using skill points that you’ll earn from leveling up and for completing missions. It isn’t as in depth of a skill tree as some other RPG’s but I still enjoyed unlocking new skills and some of the better ones you can unlock early. I was at the max level of 50 and had all the skills unlocked well before I reached the end of the game. You earn XP to level up from pretty much everything in the game whether it’s from missions or just running around killing enemies. By the end of the game I had put 60+ hours into it but you could do it in less probably. There are so many other things I haven’t touched on such as different outfits that you can buy to not only change your look up but that offer different protections against certain things. Weapon and armor mods can also be used to increase these areas. Scavenging plants from around the world and parts from chests, machines you defeat etc can be used to craft things like potions, ammo as well as upgrade your various bags. Most of my early time playing I was just running around gathering resources to upgrade my bags so that I could carry more weapons, ammo, health potions and more. Then there are collectibles scattered around the map some of which are related to trophies while others are text or audio logs that help provide more lore. 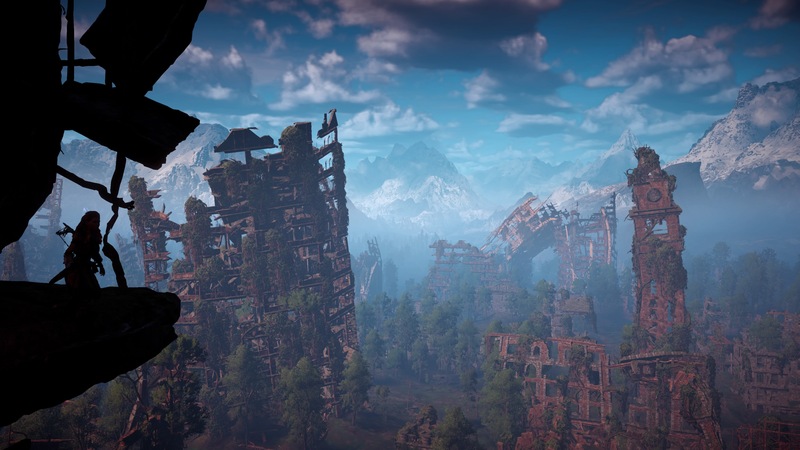 The world of Horizon: Zero Dawn itself is vast, varied and truly jaw dropping to behold. I played the game on a PS4 Pro on a 4K TV with HDR and this is the most beautiful game I have ever seen. Forests, deserts, snowy mountains, and ancient cities all look amazing and the contrast between nature and machine really makes the game stand out. The game has a Photo mode and I have never stopped so many times in a game before to take a picture because of just how good it looks. The game also never really stutters or suffers any kind of performance issues which is even more incredible when you think about just how good it looks. 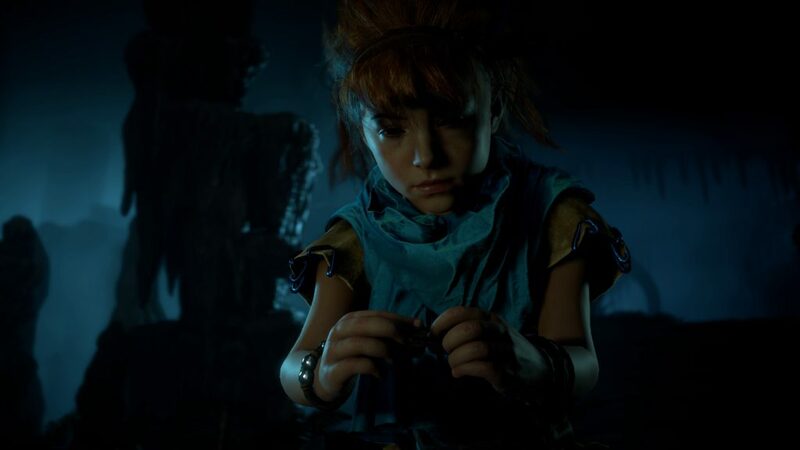 Little details really make the game stand out too such as ants crawling on the tress, puddles formed by rainstorms that then evaporate in the sunlight, and the reflections in Aloy’s eyes are just a few of these amazing little touches. Horizon: Zero Dawn has set the bar high visually for every other open world game that will come after it. Audio in the game is also top notch stuff with great ambient sound effects throughout the world. The soundtrack is great whether you are just roaming around or are in the thick of battle. 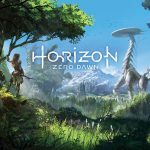 Horizon: Zero Dawn is a testament to the hard work and passion of every individual at Guerrilla Games. Every area of the game shows just how much love and care they put into this brand new IP. It is one of the best games of this generation and is a game of the year contender hands down. It has a masterful, well thought out sci-fi story, great voice acting, a huge open world full of fun things to do, and is a technical showpiece. 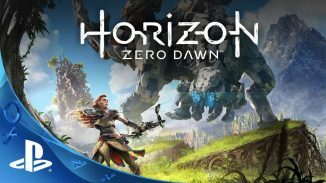 The game is not perfect and a potential future sequel can improve on some things but Horizon: Zero Dawn is a must play for current PS4 owners and one of if not the best reasons to go out and buy a PS4. Guerilla said they are already working an expansion so it really doesn’t have to end. It will be interesting to see what Sucker Punch is working on. Yeah I know they did and I’m very excited for what that expansion could be. As for Sucker Punch the rumor is it will be a brand new IP. I think Infamous is done for now.